Fax Voip Windows Fax Service Provider (Fax Voip FSP) enables Microsoft Fax and Windows Fax and Scan, which are built right into Windows, to send and receive T.38 and audio (over G.711 codec) faxes using your VoIP (SIP or H.323) infrastructure without any further cost. 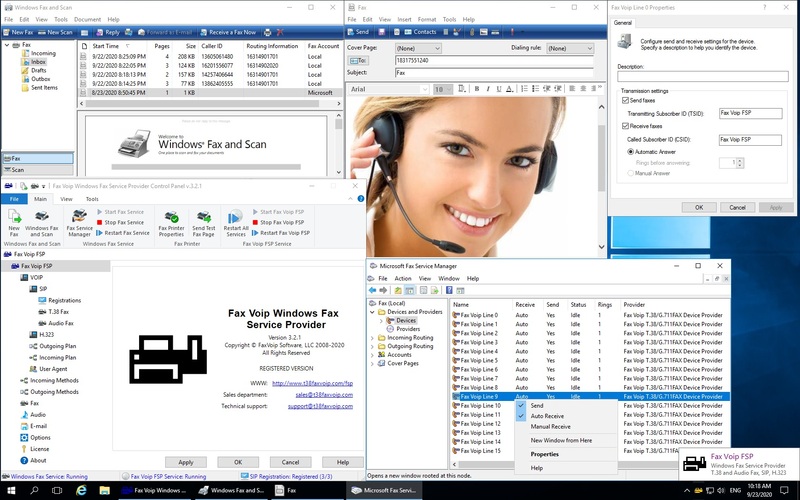 Windows Fax Service and Windows Fax and Scan application is an integrated fax software included in all Windows versions. It is an extensible fax platform that you can use to deploy shared fax resources in your organization. Fax Voip FSP replaces the standard Microsoft Modem Device Provider by the Fax Voip T.38/G.711FAX Device Provider. This allows you to use the Windows Fax Service most efficiently. In particular, the ECM (Error Correction Mode) is supported. The busy signal is also detected correct way. Using Fax Service Provider (FSP) instead of Virtual COM Ports and modems significantly improves reliability of your fax system. Fax Voip FSP allows Windows Fax and Scan to receive Caller ID and Called Number (DID) - via Routing Information field. Multiple SIP Registrations and Call Routing functions make your system the most flexible as well as allowing you to work with different SIP and H.323 providers simultaneously. The Mail to Fax function will let you send faxes directly from your e-mail application. The body of your e-mail messages will act as the fax cover page, while any attached documents (e.g. PDF, TIFF, or TXT formats) will be converted into additional fax pages. Faxes can be sent to multiple recipients. Fax Voip FSP Routing Extension allows you to route incoming faxes depending on the Caller Number (Caller ID) and Called Number (DID), using the following fax routing methods: Route through e-mail, Store in a folder, Print. Custom routing for incoming faxes allows you to easy add any routing functionality by using custom application that is started after receiving a fax. Fax Voip FSP has been successfully tested with CALLCentric, babyTEL, T38FAX and many other VoIP service providers.